In light of the great 3 free promo that Zoya is having right now, I thought I would take the next couple of posts to highlight a few more Zoya polishes. 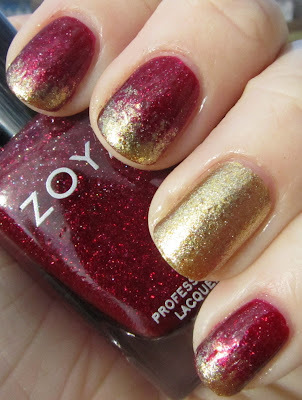 Today I'll share with you all a fun sponging manicure I did using two more of the Ornate winter 2012 collection polishes, Zoya Blaze and Zoya Ziv. 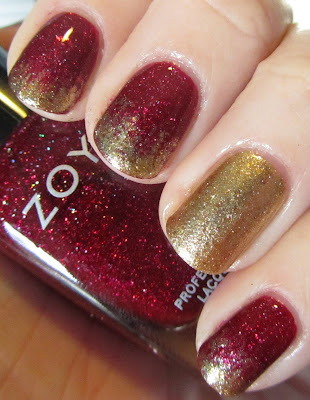 Zoya Blaze is a cool-toned deep red with holographic glitter. Like the other holos in the collection, this is a smooth polish, not gritty like some glitters. The holo in this one is a bit more muted than in Aurora or Storm, but give the polish a really unique depth. This is one of those polishes that seems to "glow from within," and it is really beautiful. Two coats for full coverage. 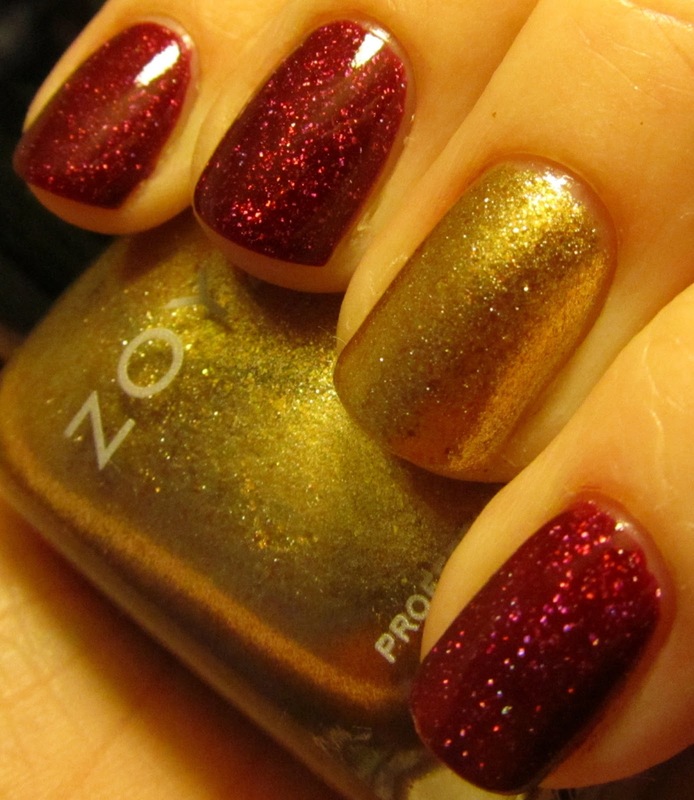 Zoya Ziv is a mid-toned gold metallic foil. It has a bit more to it than your average gold foil - mixed in are some warmed gold flakes that really give it extra depth. Applied well in two coats. For these nails I used Ziv as an accent nail, and then sponged Ziv onto the tips over Blaze. The two look really nice together! 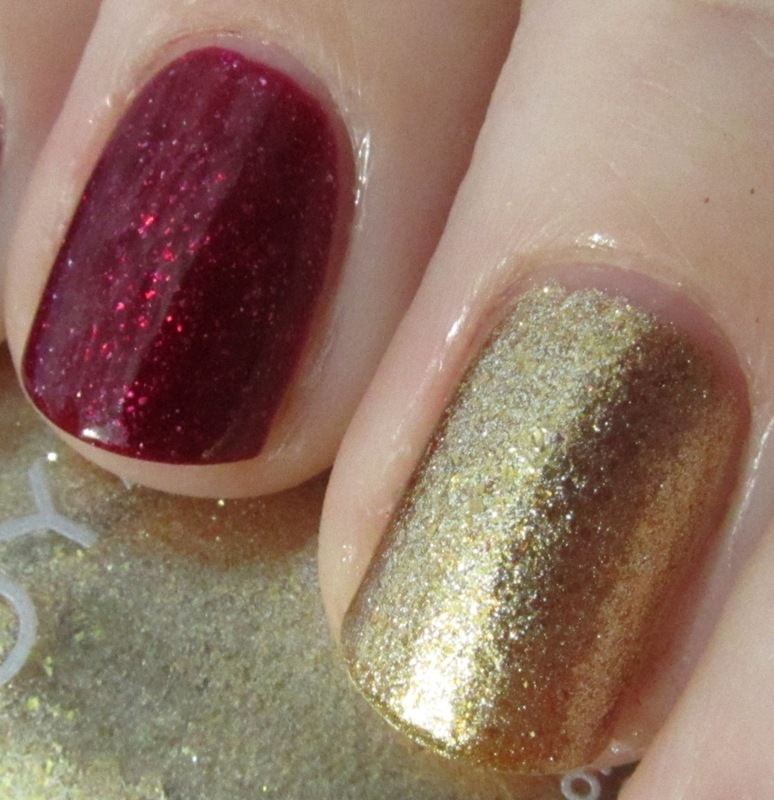 Here are some shots of the two polishes without sponging. I have been really pleased with the four polishes I got from the Ornate collection - these two as well as Aurora and Storm - and would highly recommend any of them for your promotion choices! The other two from the collection are gorgeous as well and I am sure you'd be pleased with any of them. Very pretty! I like that the sponging matches the accent nail. Very pretty! Blaze is my new favorite red. Interesting combo. Looks nice together.